With Easter two weeks away now is a good time to begin planning your Easter decorations for family gatherings. 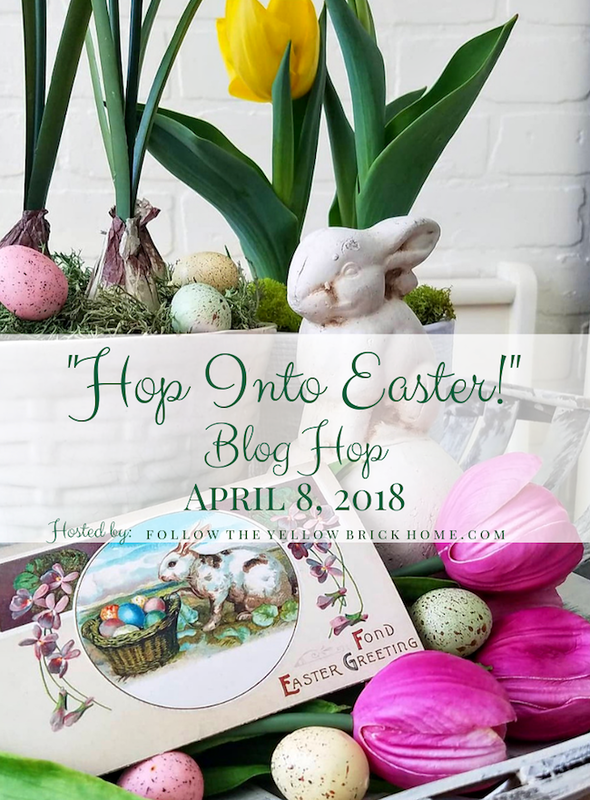 Amber of Follow the Yellow Brick Home is hosting over 30 bloggers with Easter ideas in a Hop Into Easter Blog Hop. 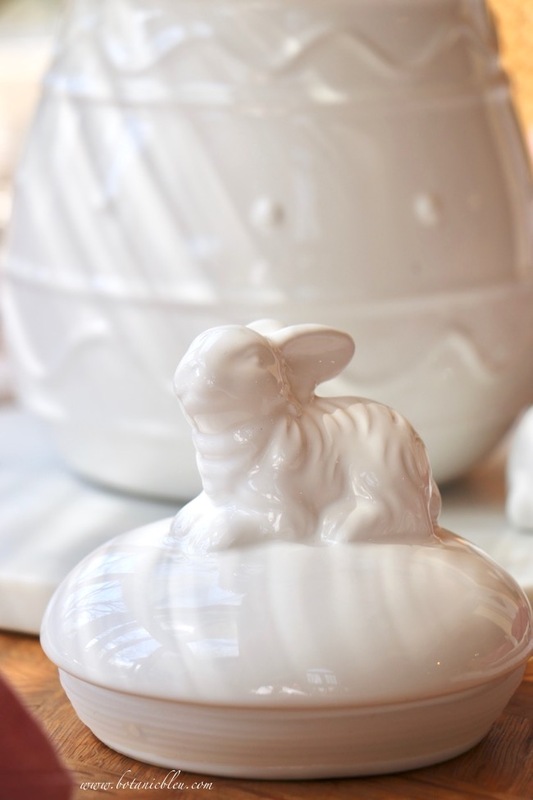 Be sure to visit all the links at the end of the post for Easter ideas to use in your own home. 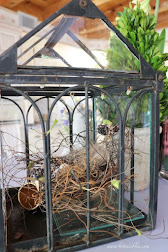 If you are following the links in order, then you came from My Thrift Store Addiction and her whimsical Easter decor. Thank you for stopping by and welcome to my Easter table setting. For Easter this year my table setting is in traditional Spring pastel colors, and two things determined the pink and white color combination. One a flower, and the other, a birthday present. Pink ranunculus flowers with their tissue-thin petals fading from dark pink to shades of white fool the eyes into thinking they are not real. Surely these perfectly formed delicate flowers are artificial, but no, they are real. 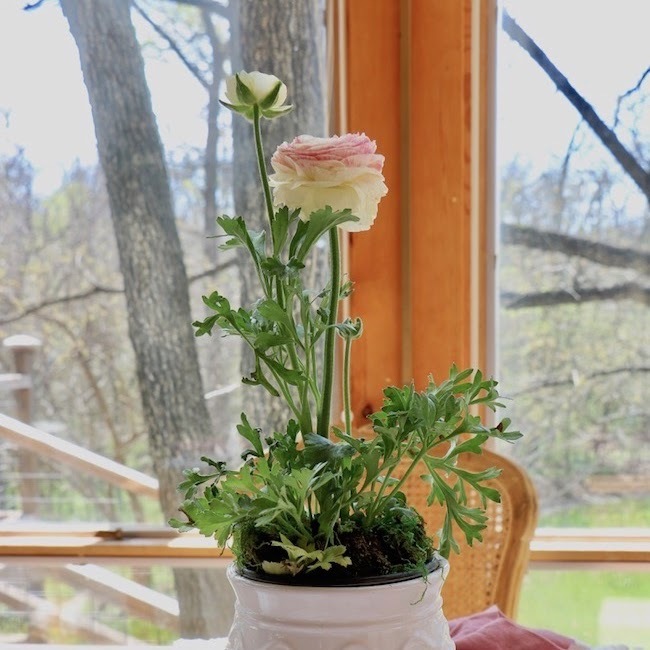 The nursery had many ranunculus in a range of colors, but as soon as I saw the pink one, I knew it would be a stunning centerpiece for an Easter table. A white storage jar designed like an Easter egg is the right size to hold the ranunculus flower in its original nursery plastic pot. Preserved moss dresses up the potted ranunculus. 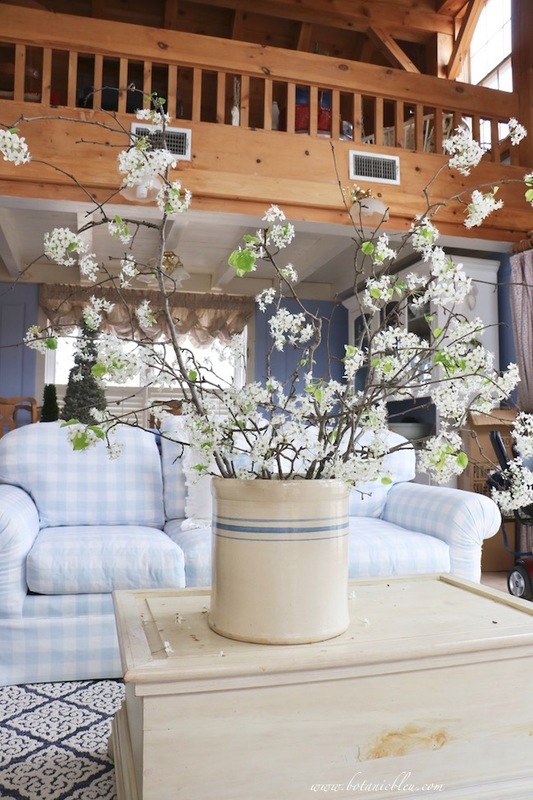 Keeping potted plants in their original containers makes it easier to remove them from a vase or container used as a centerpiece. 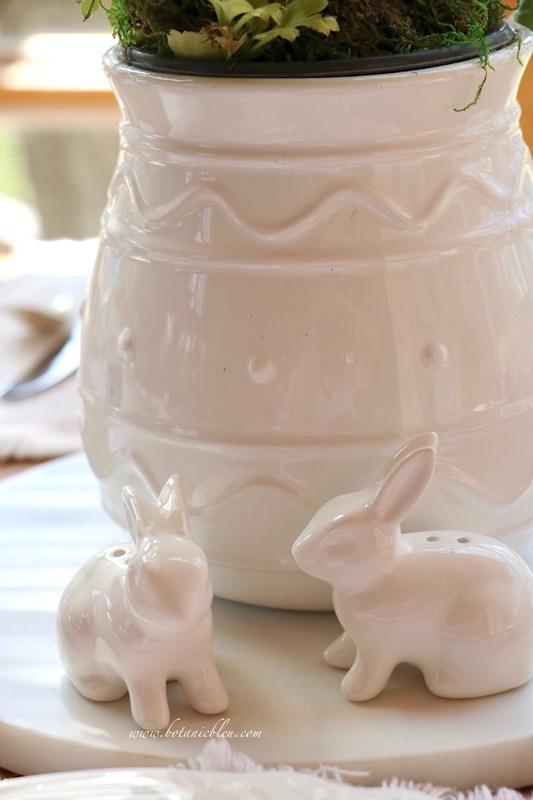 The lid to the storage jar has a bunny handle which adds to the table decorations. With a stunning flower in a fun seasonal container as a centerpiece, only a few additional decorations are needed on a small dining table. 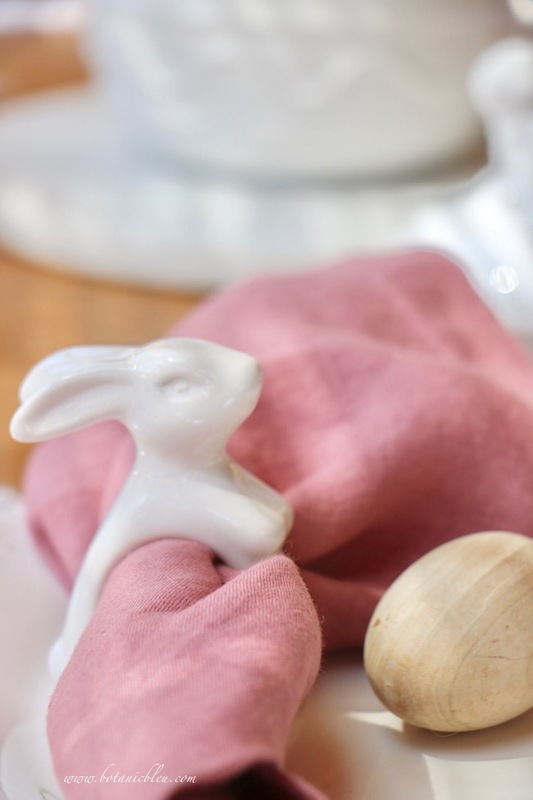 White ceramic bunny salt and pepper shakers, ceramic napkin holders, and natural-colored wooden eggs complete the Easter table decorations. Not only is the flower a beautiful harbinger of Spring and Easter, the multiple pink colors go well with a set of rosy linen napkins and plaid fabric placemats. This set of eight linen napkins was the last birthday present one of my brothers gave me. He helped my sister plan a surprise significant birthday garden party for me two Springs ago, and these napkins were his present to me. He died last Winter before my next birthday. Using these napkins is a special way of remembering him and his joy in parties. Read about that special birthday party and how my brother helped with the party at Spring Garden Party. 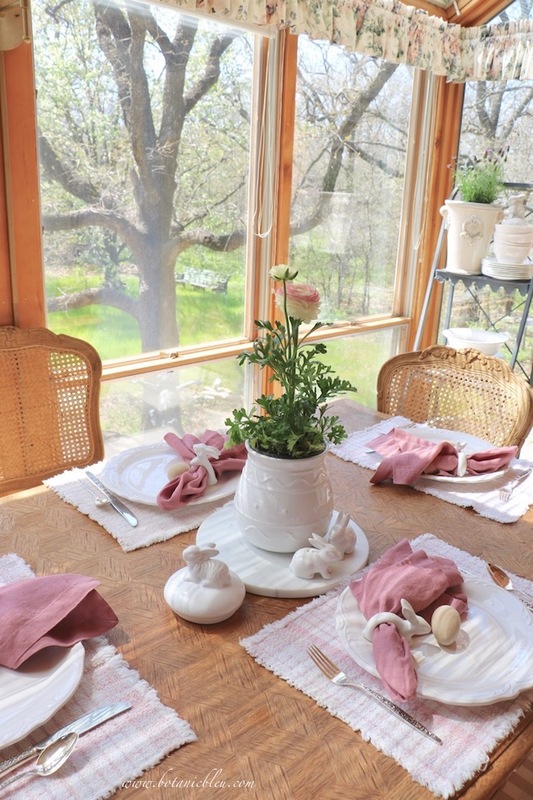 The pink and white Easter table setting is on my antique French Country breakfast table in the kitchen sunspace area. The large windows bring Spring right into the house. 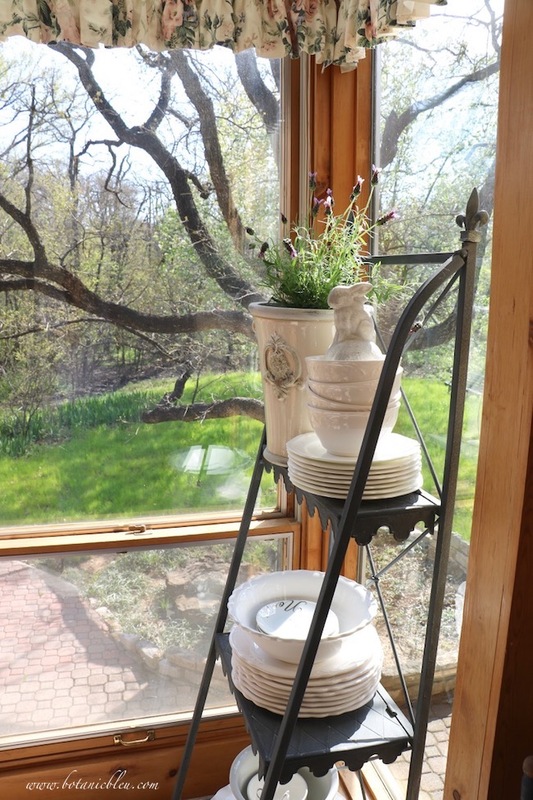 The French-style plate stand near the dining table holds the rest of the set of the white dishes used for the Easter table setting. With only a few additions, the white dishes are easily updated to any season of the year. 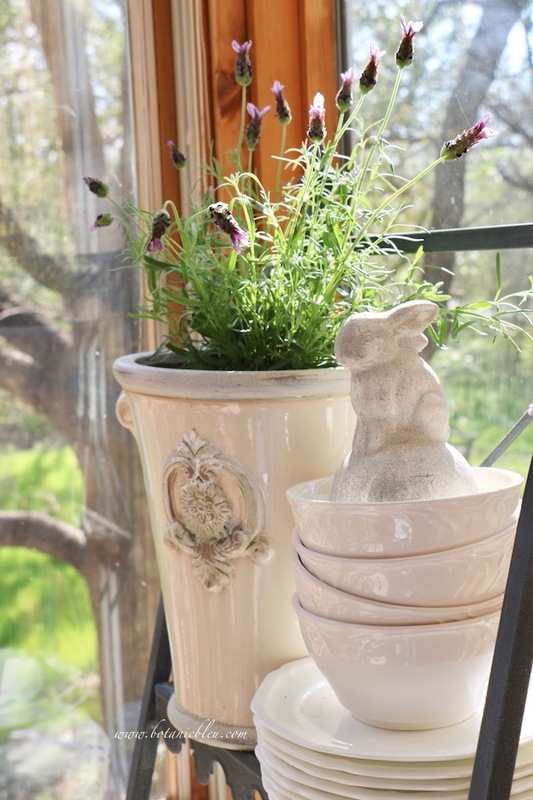 A Spanish lavender plant and a white bunny declare the Easter season this Spring on the plate stand. Beautiful unusual flowers and presents from family members are two great items for creating a special table arrangement. 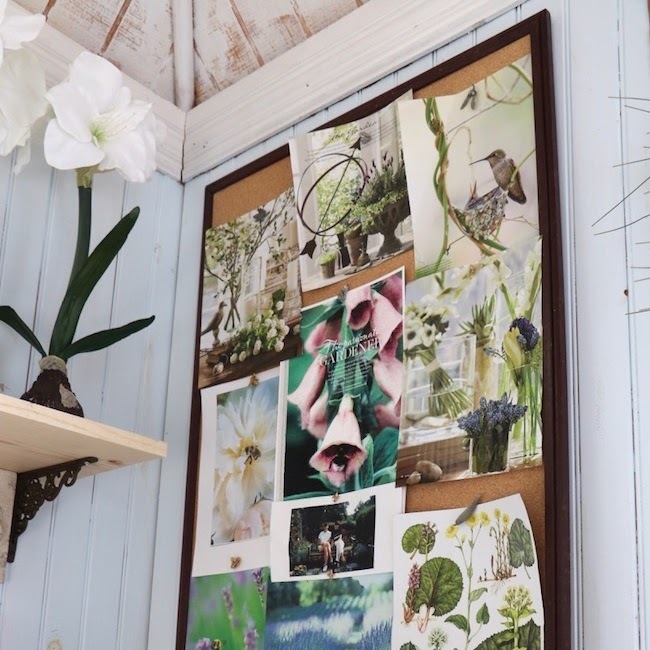 I hope you found an idea or two that sparked creative ideas for your own home. 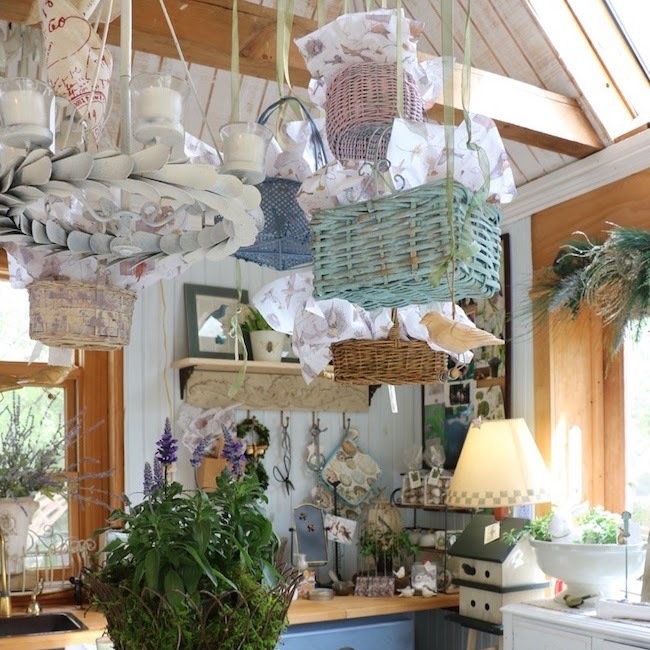 Next up is Rosemary & Thyme with her latest post for Easter decorating. More great ideas for Easter . . .
Beautiful. I know the pink linens are a treasure to you. Pink and white is so classic. I love the white dishes and your flatware is iconic! A beautiful sunny corner. 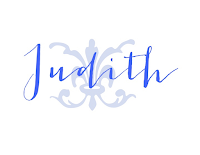 Such a serene scene Judith! I hope your spring event went well. Your breakfast nook is amazing, one of my all time favorite spaces. I adore your beautiful tablesetting, and the pink is gorgeous. I am in love with your breakfast nook and the table setting. Those flowers are so pretty in the center of the table. Hope you and your family have a wonder Easter season! What a beautiful table! I love all the pink and white and those cute bunnies. So nice that you have something special from your brother. Your tablescape is so lovely, Judith! It looks like the little bunnies are running about exploring...so cute! Simply beautiful!! Loving the simple spring touches!! ranunculus are one of my favorite spring flowers! So pretty!!! Everything is beautiful, but the story of the pink napkins is so touching. I love that you have them as a special memory of your brother. You have a beautiful room with those spacious windows and a gorgeous view up in the trees. I would spend all my time sitting here. Lovely French table too, so simple and elegant with the pink and white theme. Pinning for inspiration! I love your pretty tabe, and the rununculus is perfect in the storage jar. Super idea for a centerpiece, and I love the delicate pinks on your table! Brava! Judith I love the sentimentality of your beautiful pink and white table setting. I am sure the memory of your brother's gift will live with you forever. How special. Your view from your windows is stunning and I would welcome sitting at your table sipping on tea and looking at your lovely table and the view. Thanks for linking up with celebrate your story link party. Thank you. Come on over for some tea and gazing out the windows. Love the simple table arrangement especially using real flowers. Ranunculus are one of my top favorites. I loved the sentiment behind those napkins from your brother. What a sweet thing to look at often. Judith, I absolutely love the white Easter vase. 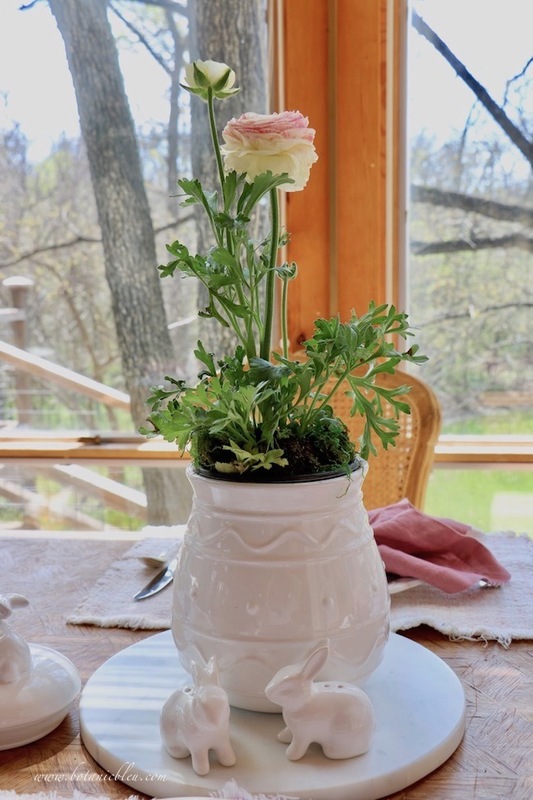 The ranuculus is stunning as it you beautiful tablescape in the sun~filled dining room. I’m so sorry about losing your brother. It sounds like he was a special person. It warmed my heart to read that your pretty napkins were a gift from your late brother. I know that you think about him every time you see them. They look beautiful with your pretty flowers and adorable bunny napkin rings. What a lovely table. 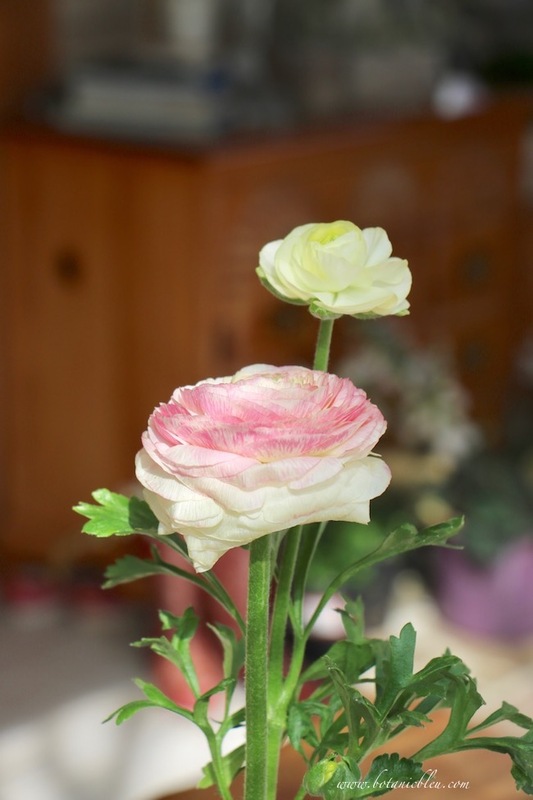 The ranunculus is beautiful and coordinates perfectly with all of your pink and white accents. Lovely. I hope that setting the lovely table with gifts from your brother brings nothing but sweet memories. Judith, Ranunculus are one of my favorite spring flowers. 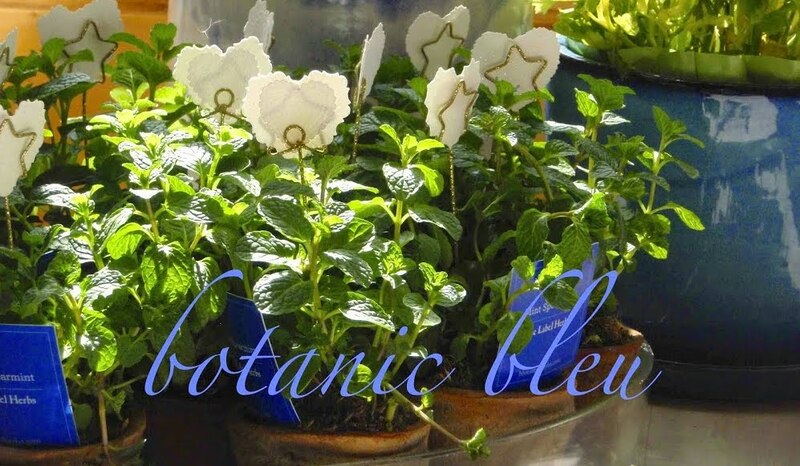 They are beautiful in the white pot. Pink and white are perfect for spring! 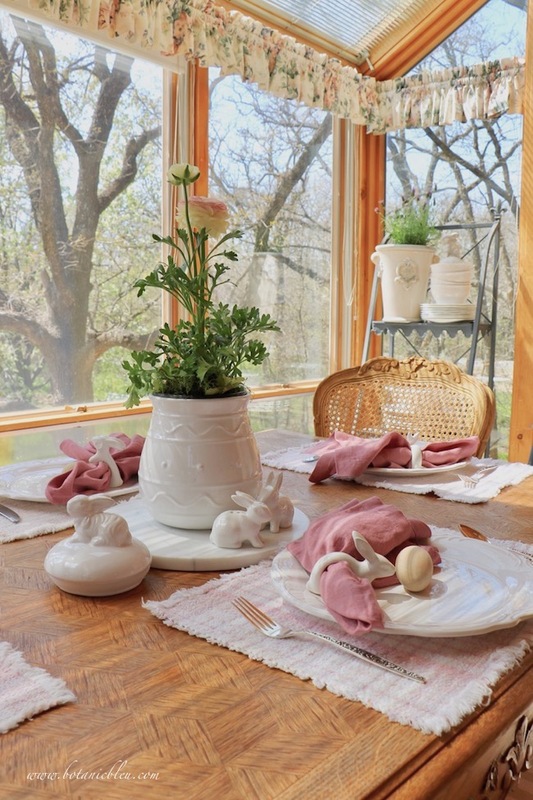 beautiful tablescape with the wonderful pink table linens and adorable white bunnies. Happy Easter Judith! 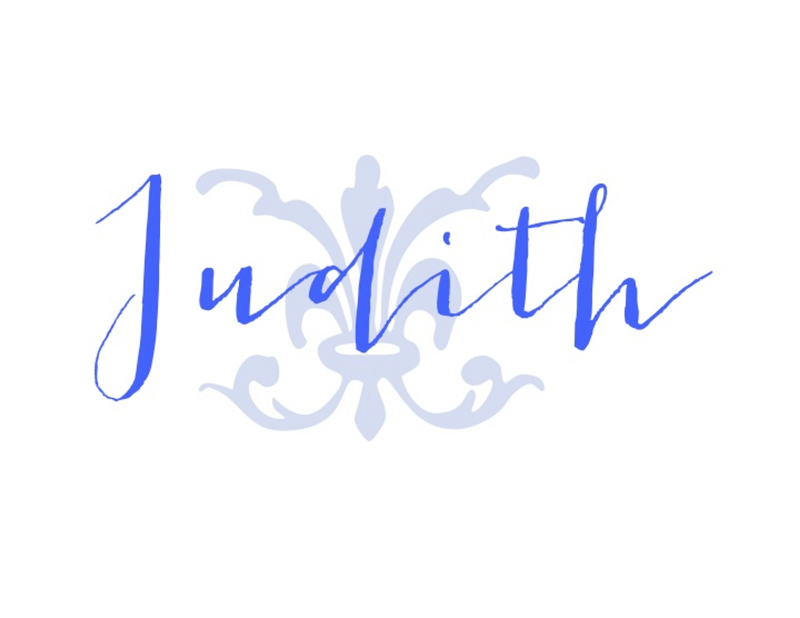 So beautiful Judith! That dining area with garden views gets me every time! I love your pretty ranunculus and sentimental napkins, along with the bunnies. 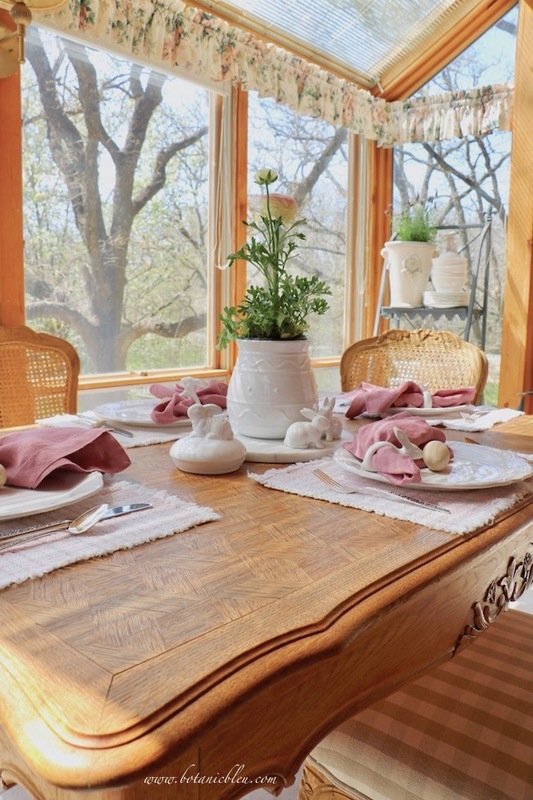 You have created a special and simply beautiful table for Easter. A bit of lavender is always welcome in any setting too! Thanks, CoCo. My brother loved entertaining and having friends over. Such a beautiful view from your dining window and your tablescape is so lovely. I love that you used the napkins your brother had given you, as they will always hold a special place in your heart. I love all your little white bunnies you have scattered here and there. 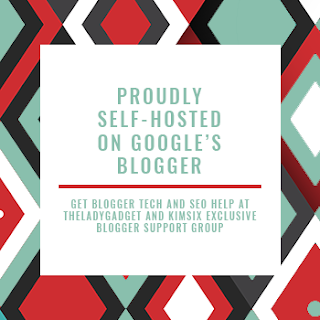 May you have a Blessed Easter and it was so nice to be part of this wonderful blog hop along with you! That ranunculous is just too perfect; so delicately colored. It does make for a beautifully sweet centerpiece. And such a lovely setting; just like being outside! Os tons pastéis são muito delicados. 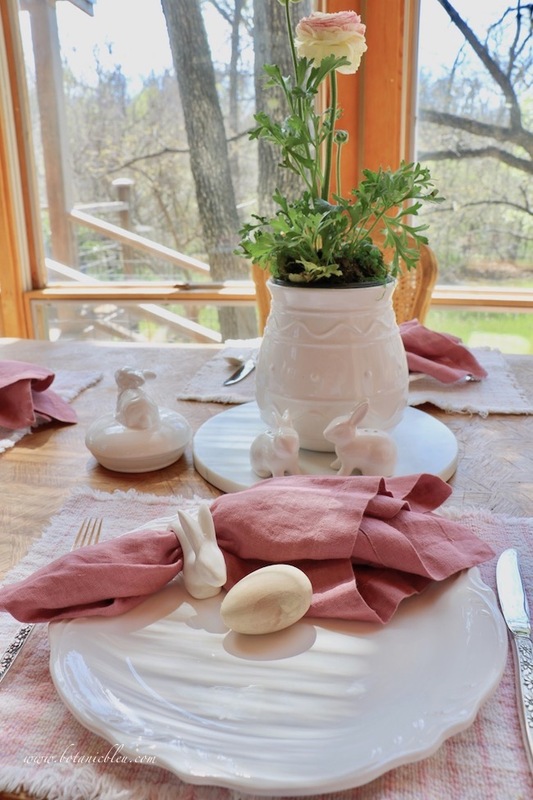 Judith, your Easter tablescape is lovely! I love how you tied in the pink, white and green colors through the tabescape and the pretty Easter display behind it. Your table it beautiful Judith and those bunnies are just darling!! Your table is absolutely elegant. 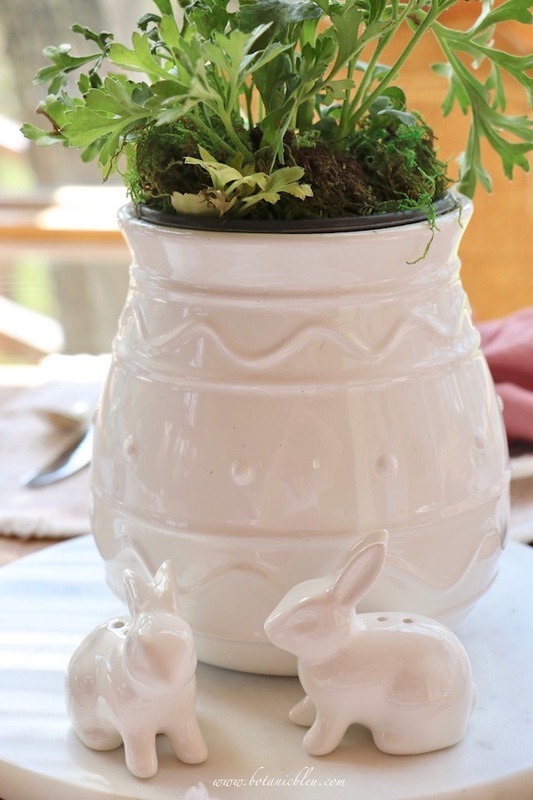 I love the white ceramic bunnies and plates with the gorgeous pink Ranunculus as your centerpiece. My favorite part of your tablescape were the sweet pink napkins from your dear brother. Im sure he would be pleased to see you enjoying them and thinking of him. I'm so sorry for your loss. I absolutely love seeing your breakfast nook from that gorgeous table to the fabulous wall of windows. It's so sweet in pink!